Creating a world of one’s own as a child is the beginning of our stories, Farley shows — and is sometimes made more vivid when shared with a sibling or friend. Like a beloved box rattling with tiny, precious, ferreted things, this delightful picture book holds small, wonderfully specific insights into childhood imaginings, feelings, and frustrations. The text, written from the younger sister’s perspective, is clear and appropriately simple, the large font and spacing between sentences making it approachable for beginning readers...This is a familiar and fun story, and a good resource for children with siblings. Farley knows that, for many kids, the imagining can be as good as the having, and while the older girl eventually takes pity on her sister, the story reveals a keen emotional understanding of the frustration of being unable to bend a loved but dissimilar sibling to one’s will. Characters, along with the fantastical figments of the younger sister’s imagination, are appealingly rendered in mixed-media illustrations that give a nod to child-made drawings. Similarly, Farley’s quirky text embellishments (“Inside the fort, there’s a marshmallow and chocolate storage compartment…”) feel genuine and demonstrate a sensitivity for what children value. This tale of believable sibling rivalry gets a boost from its portrayal of unfettered creativity and an appreciation for the unbelievable. The mixed-media fantasy is a visual delight, and big sister’s relentless reading through her sister’s ravings is an effective counterpoint. The reconciliation between the bookish and the boisterous hits just the right note, with the younger child conceding she made it all up, and the older realizing there might be some pleasure in making things happen rather than just reading about them. It’s a sweet solution that highlights the kindness and indulgence of older siblings as well as the pull of make-believe. The pencil-and-ink illustrations start small, focused on the two girls, until the younger sister’s imagination cranks into gear. 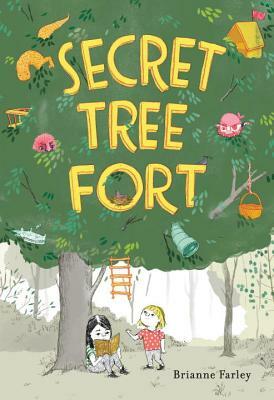 As she reveals more about her fort, the illustrations show the two worlds overlapping.